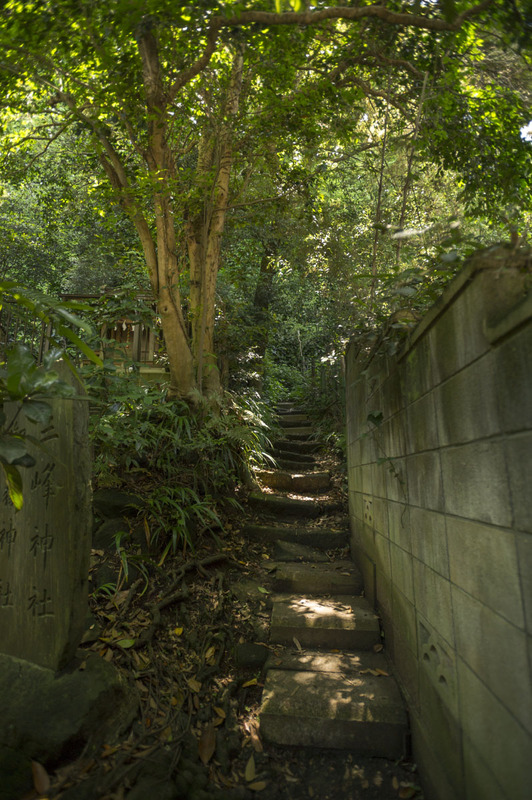 At the tiny Gosho Shrine in the ancient city of Kamakura to the southwest of of Tokyo there is a touching tiny cemetery (very rare for a shrine) with something as rare as a wooden cross seemingly carelessly leaning on the old stone wall. 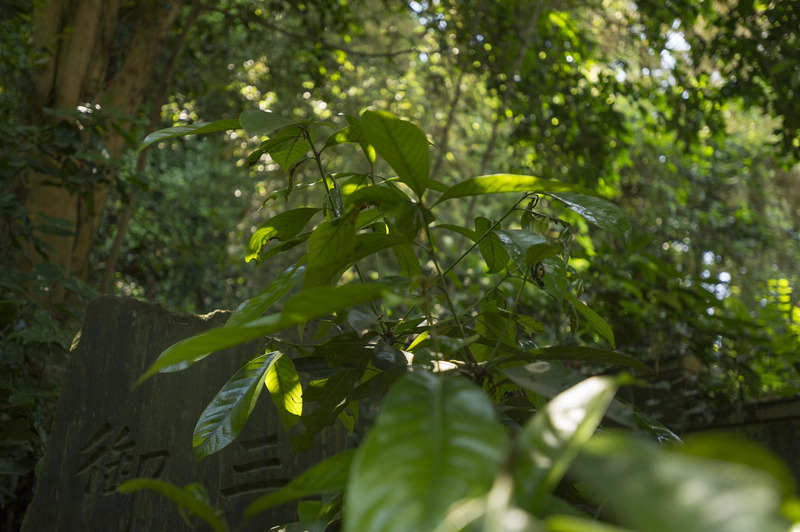 The cross marks a tiny statue that is said to represent the grave of one of the very few Hidden Christians of Kamakura, or at least so the legend tells. 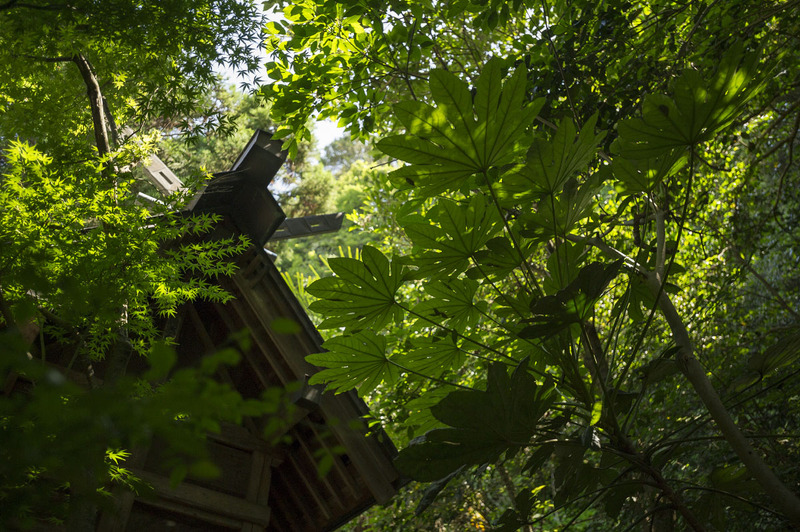 It is said that someone living near the shrine placed the statue where it is now, but nobody knows who or when. Since then the statue has been affectionally referred to as the Granny of Spring Time and used to hold flowers. The tiny statue fits snugly into two hands (but you can’t touch it, it is far too brittle and old!) and has a lovely but very sad and pained expression on its weathered face. The statue’s hands are clasped behind its back, with a square hole between what might once have been fingers. The woman is kneeling forward, and it looks almost like her arms have been bound. From the front the faint outline of her kimono is showing, and since the left side of the collar is to the front, we can assume that she is wearing a burial kimono in a style reserved for the dying or soon to be dead. 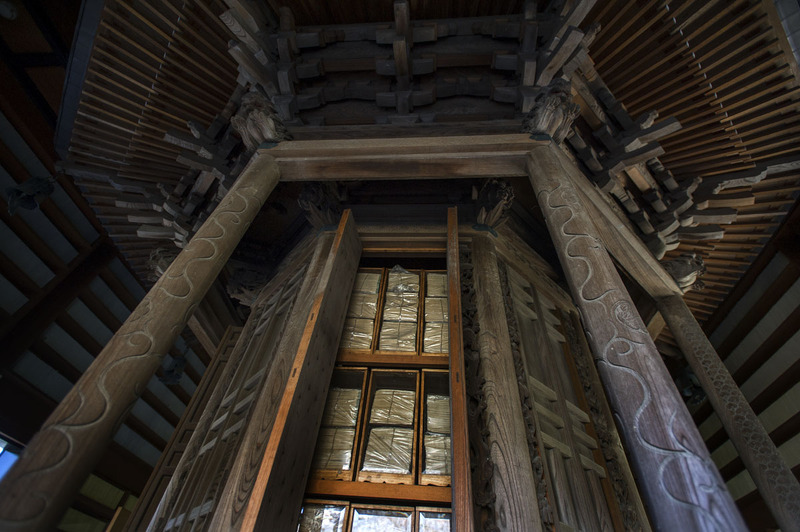 The thinness of the sash could be the mark of a prisoner, and someone, maybe herself, has carefully folded her kimono under her bended knees in a very elegant and careful manner. The elegance of the kimono, the painful expression and the hands tied behind her back gives her a dignified expression despite the situation. A few years ago a few characters were identified carved into the base of the statue, which would date it to January or February 1684, 61 years after the famous Magni Martyres Nagasaciences, the Grand Martyrdom of Nagasaki, when 52 Christians, lay people and priests, were burnt at the stake or decapitated. 26 of them were canonized in 1867 by the Pope Pius IX. 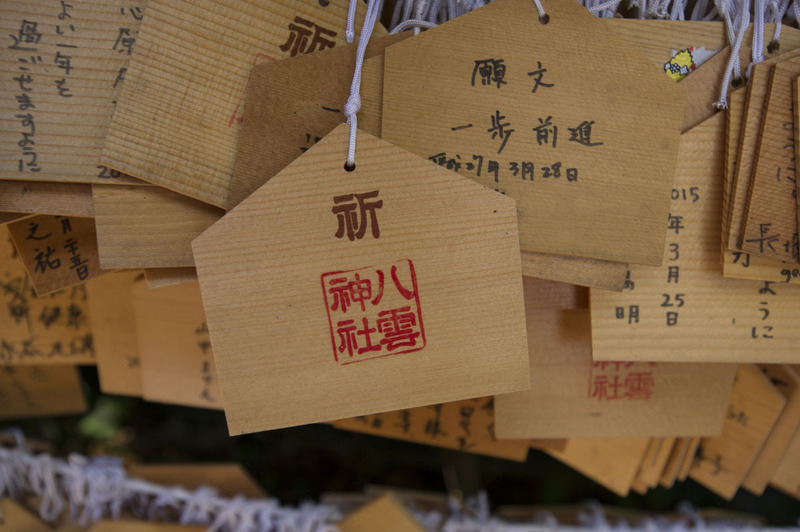 At this time, in the 17th century, the Japanese government were already well informed about world events and were well aware of the role Christianity played in helping European nations conquering and colonizing most of the planet. The Japanese were extremely determined to stop what they believed would be the eventual colonization of Japan, to the extent that they fought a bitter civil war and later purged anyone they could find with Christian sympathies, which culminated in 1637 with the Shimabara Rebellion, where a peasant army of Japanese Catholic Christians ransacked and looted buddhist temples all over modern day Kyushu island. To put a stop to foreign backed revolts once and for all the Tokugawa government in Edo closed the border of Japan and sealed the islands off from the rest of the world until it was forced to open up in 1853 thanks to US gun boat diplomacy. We will never find out who the statue actually represents, or who carved it. Could it be someone who witnessed her execution? Or is it a statue used in secret Christian rituals by a family who relocated from Nagasaki? Perhaps the statue was lost or stolen, or the people who ended up owning it forgot what it was meant to represent? Just to possess this statue up until 1853 would have been quite dangerous, so maybe some distant relative talked the owner’s family into disposing of it at the shrine, hoping that it would be taken care of? It is interesting to speculate, but we will never know for sure. Until a few years ago the statue had been used as a flower holder, but thanks to a local man with an interest in history and woodworking, it now also has a cross to accompany it. 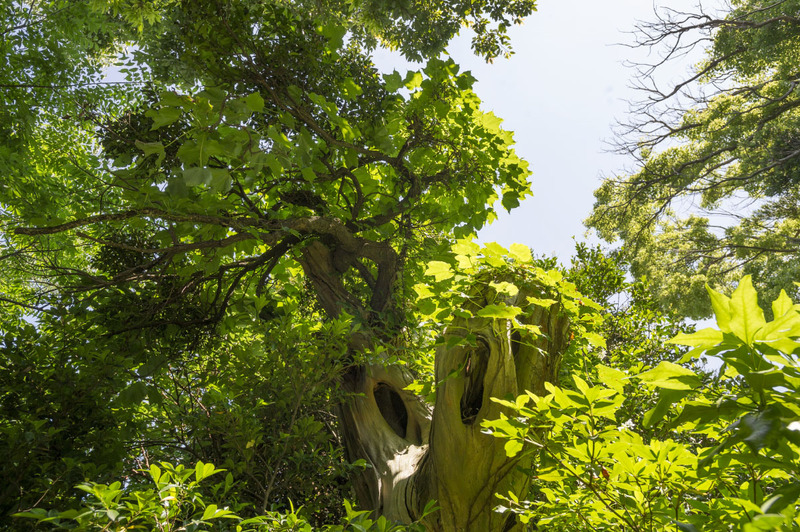 As I was looking at the statue, the sun moved through the branches of the trees opposite the statue, and for a few brief moments it was bathed in sunlight. 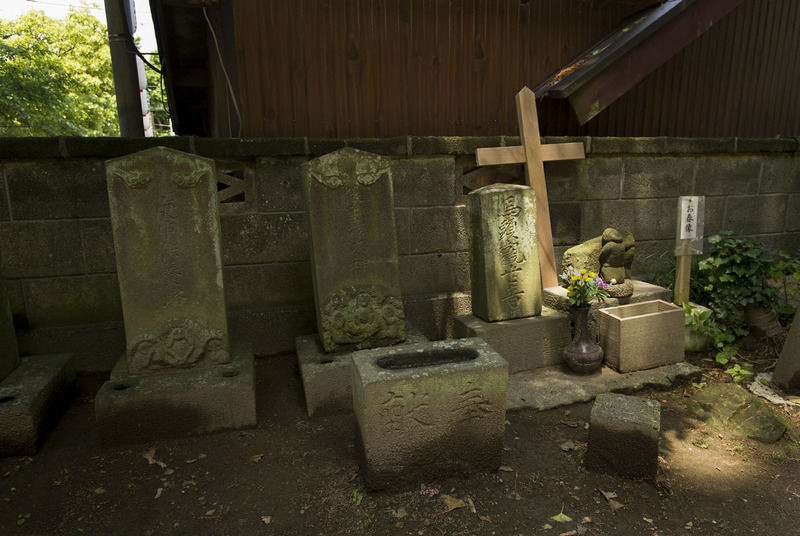 Note also, the Shinto and the Buddhist grave markers next to the statue. This is truly a cemetery for many faiths. 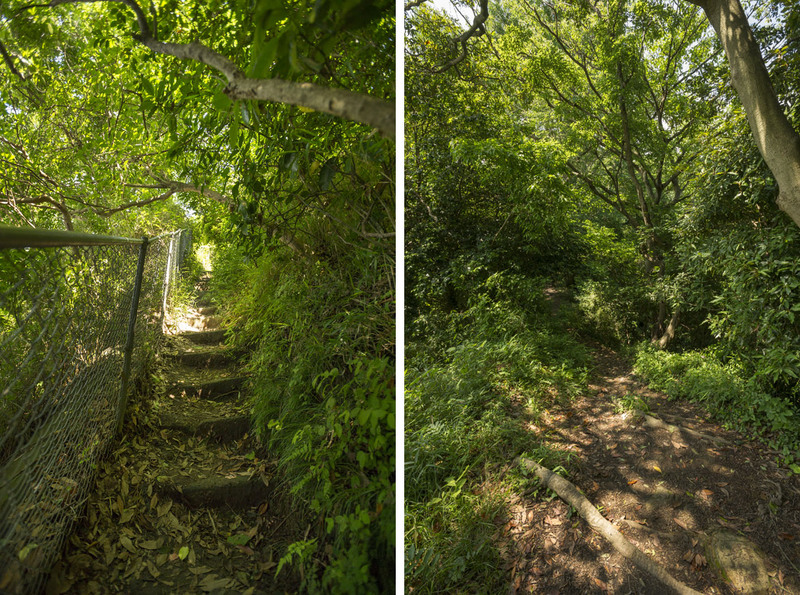 Yesterday I hinted as to the best hidden reason to visit the Yakumo Shrine in Kamakura City, and here it is, the “hidden” trail up to Gionyama mountain. 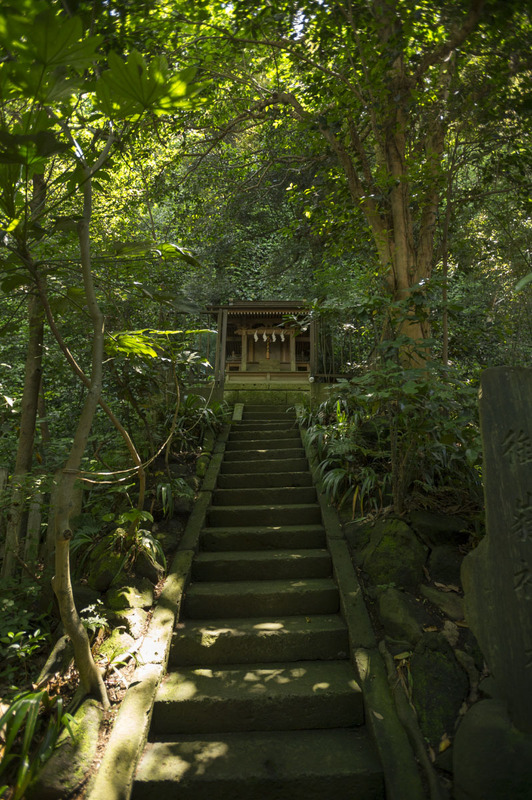 If you walk past the shrine on the right of the main building, you find a narrow path up to a tiny shrine altar (the first photo), but take off to the right just before that and you will be on your way up a very narrow (and probably very slippery) trail towards the summit of Gionyama. 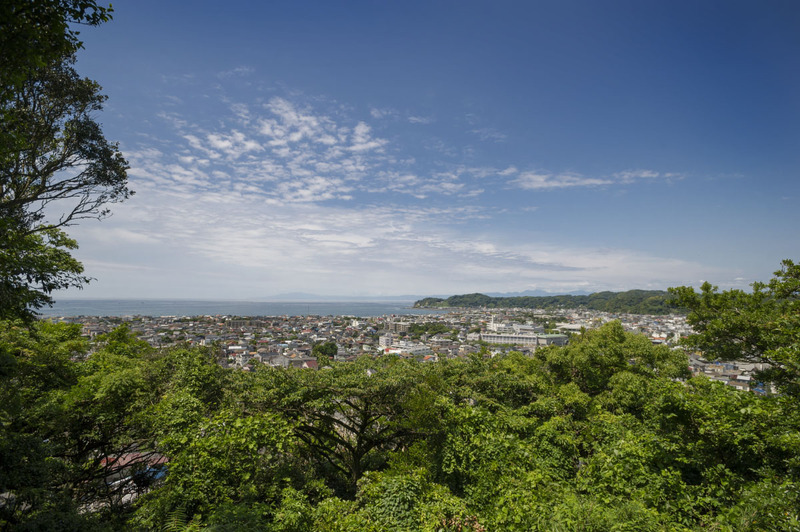 From the summit you will find a nice view over Kamakura City, and on clear days even Mount Fuji itself will be visible! 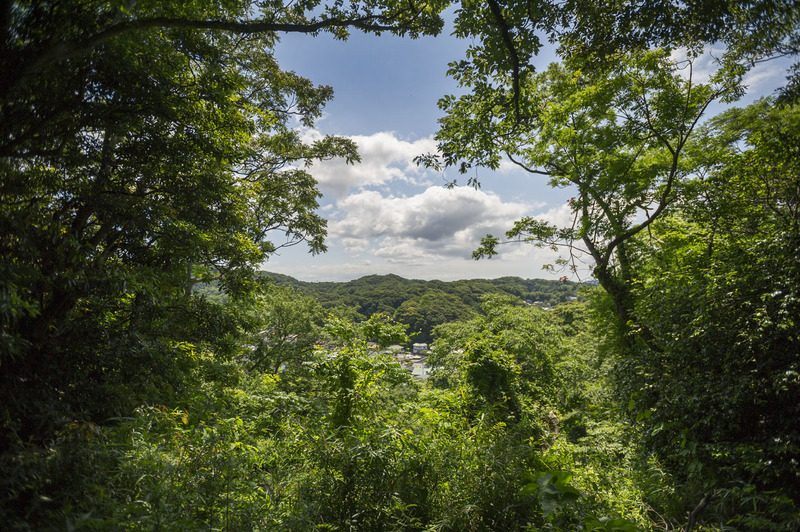 If not you can console yourself with the views of the Pacific Ocean and the Yuigahama beach in the far distance. 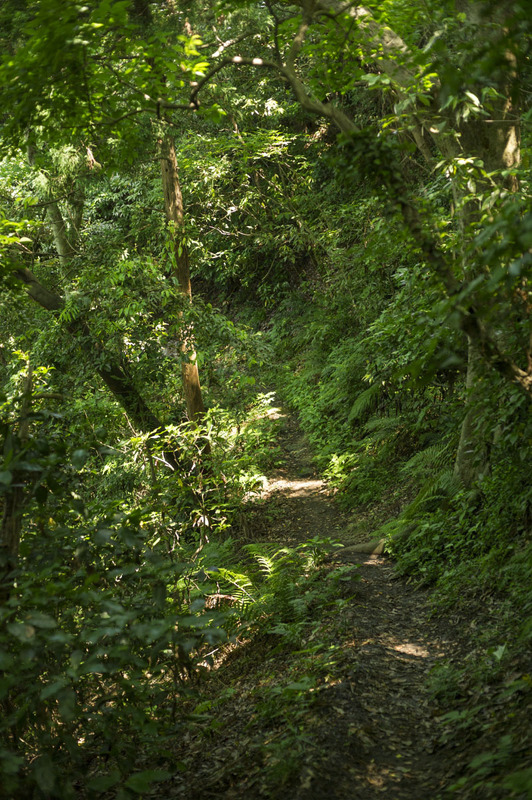 The hiking trail goes quite a bit further along the ridge and then down on the other side, not a difficult walk if you are young and in reasonable shoes but it might be more nature than you want to spend your time with, if you are on a hectic schedule to see a lot of Kamakura. 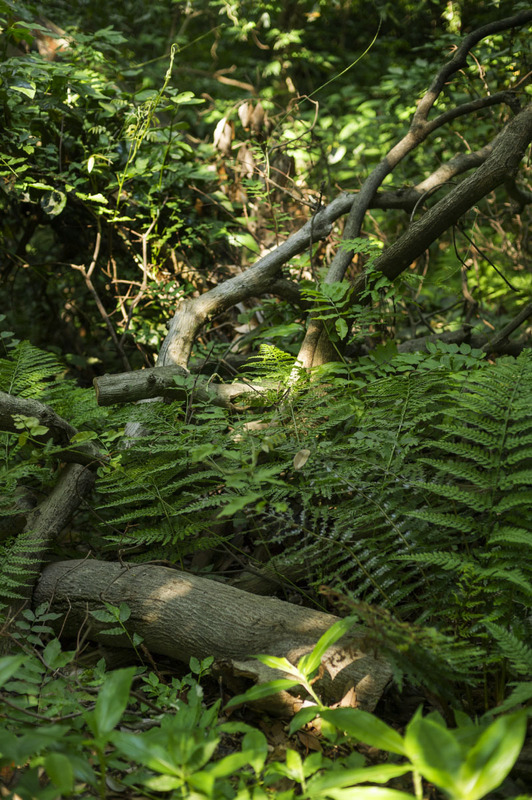 Despite the trail being quite hidden it is by no means unknown to locals, and I met maybe three or four couples or families on their way up and down the trail. 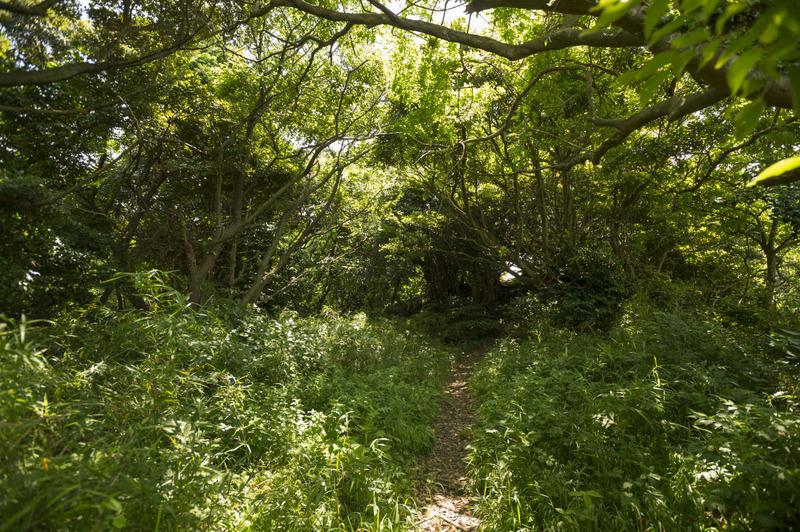 Living in Tokyo there are few chances to get out in nature like this so when you are here it is a pretty amazing feeling. 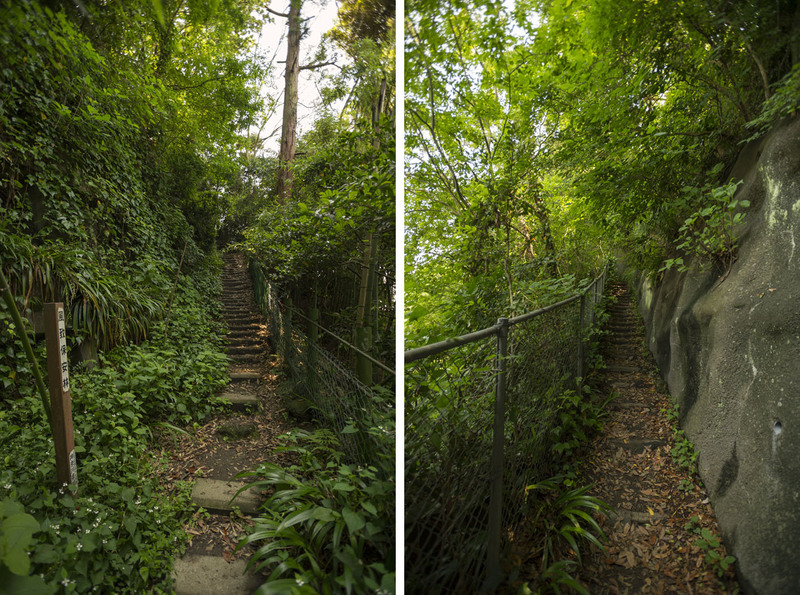 For those of you who live closer to nature my enthusiasm for this spot might look a little bit silly, but after a few weeks in Tokyo you will get it too! 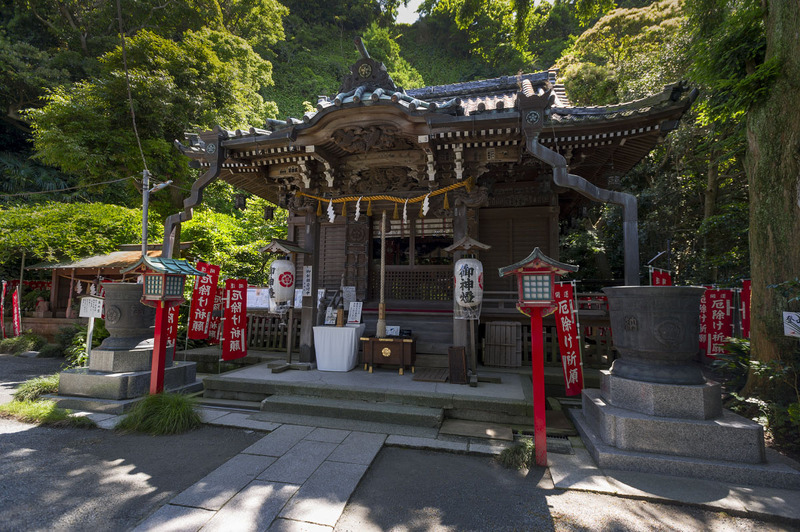 One of my absolute favorites among the many tiny shrines dotted around the historic Kamakura City southwest of Tokyo is the wonderful little Yakumo Shrine (八雲神社), hidden near the base of the mountains in the Omachi neighborhood. 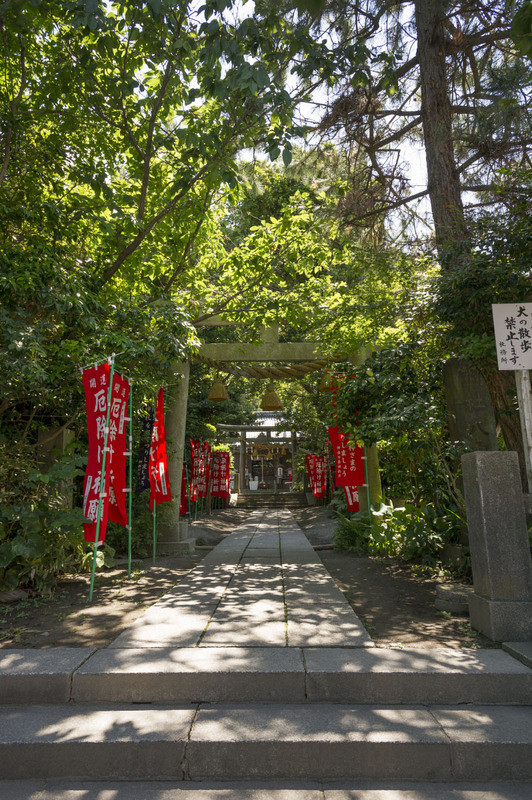 It is actually one of three Yakumo Shrines in Kamakura alone, a testament to the deep popular love for this branch of shinto shrines. 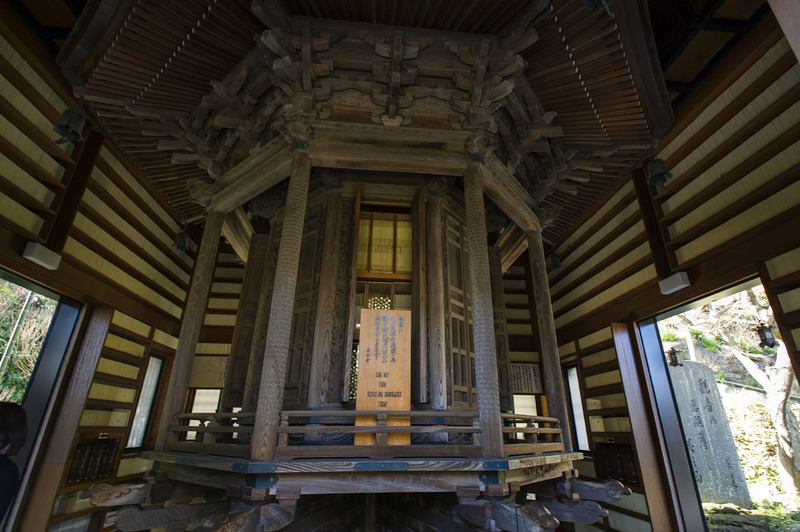 The shrine was founded sometime around 1082, when a great Shogun, Minamoto Yoshimitsu, passed through Kamakura on his way to battles in northern Japan. 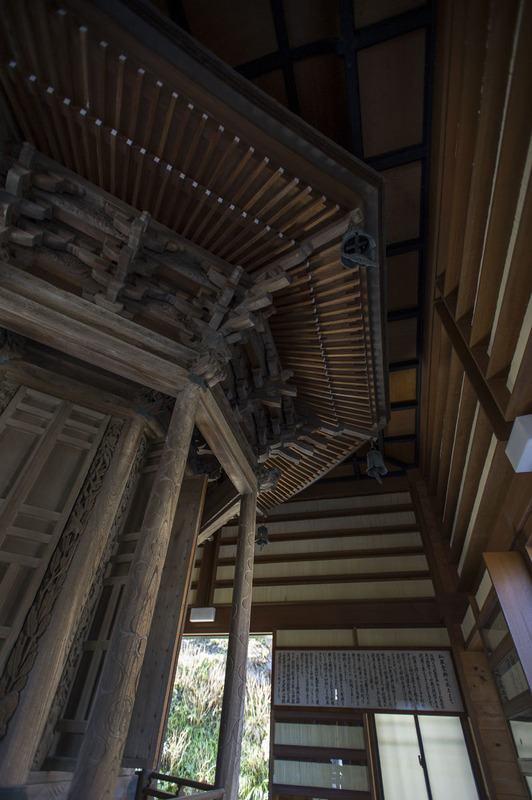 At the time there were many epidemics troubling the people of Kamakura and the Yoshimitsu thought it would be best to establish a shrine branch form the famous Gion shrine in Kyoto (present day Yasaka Shrine) which was famous for its ability to ward of sickness. 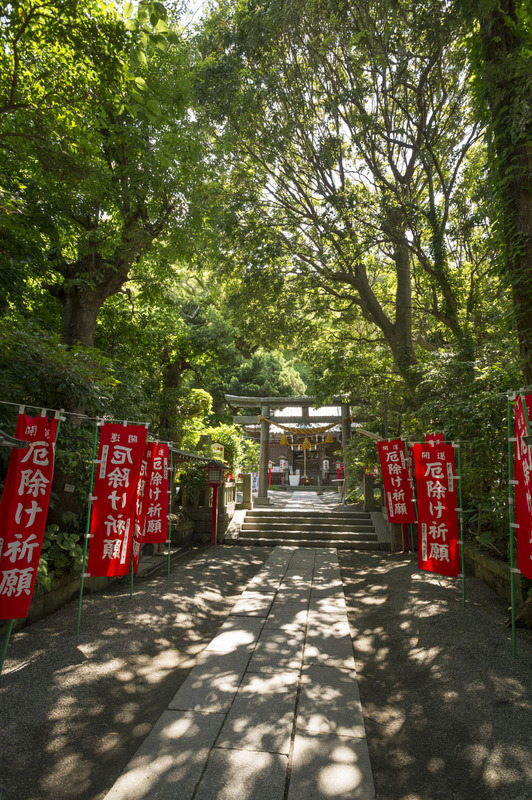 The epidemics subsided in 1084 and since then the shrine has been immensely popular in Kamakura. 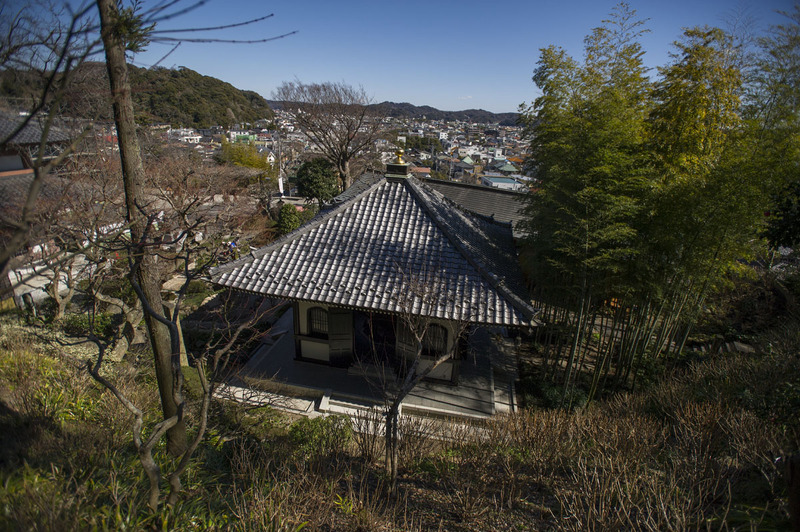 It is actually one of the oldest shrines in the city. 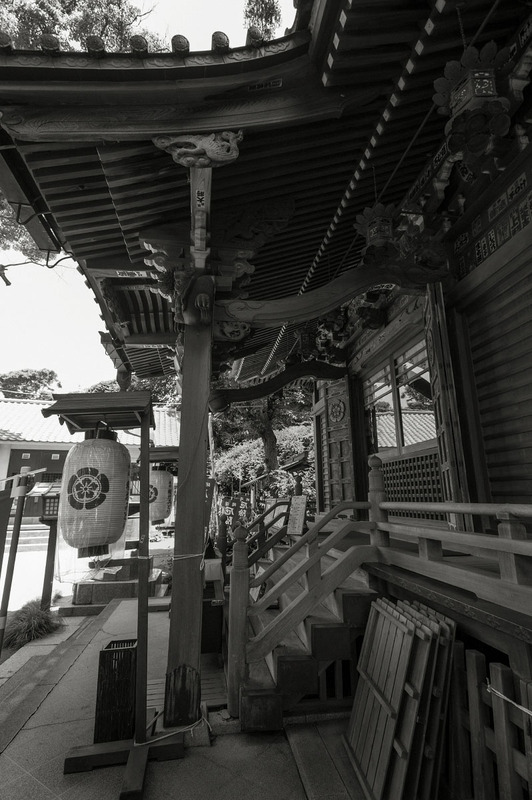 In 1868 the Gion shrines were all forced to change their names, and the shrine in Kamakura started calling itself Yakumo Shrine, although true locals still call it by its old nickname, Gion-san. 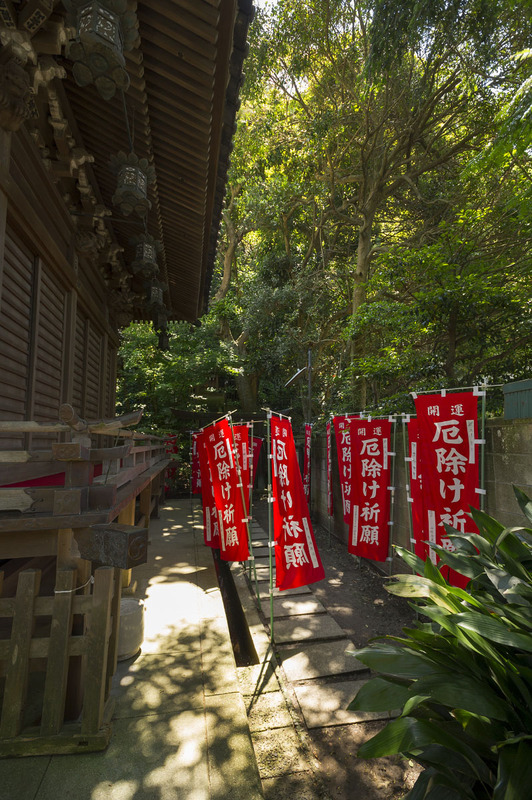 There is another great and well hidden reason to visit this shrine, but I will save that for a post later on! 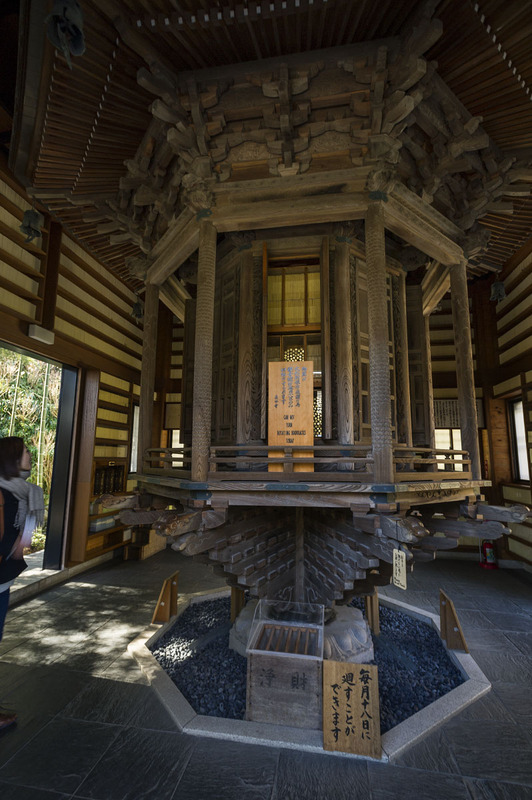 The great Buddhists temple of Hasedera in the city of Kamakura to the south west of Tokyo has one of the greatest prayer wheels (マニ車 in Japanese) that I have ever seen in Japan. 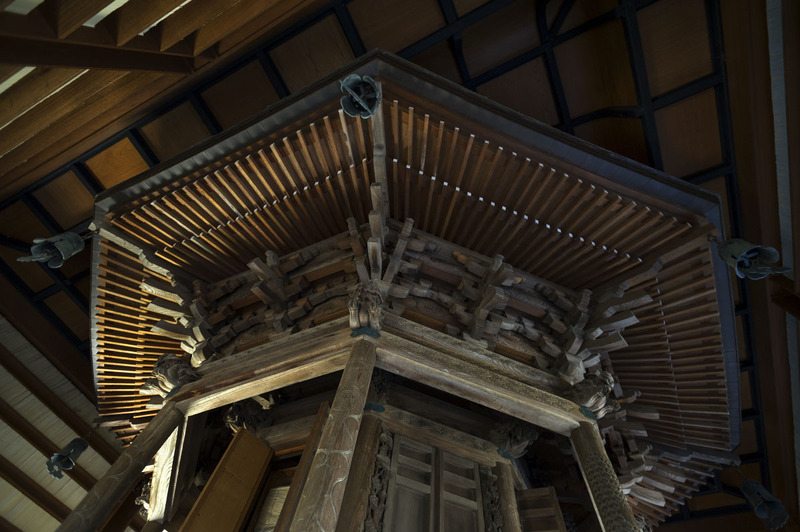 Housed in its own protective building, the house is centered on a giant prayer wheel made in wood joinery itself housing tens of thousands of handwritten pray slips, visible when the little door in the walls and the wheel itself are open. On the 18th of every month the wheel may be turned by members of the public, but on other days ordinary people can still use the prayer wheels attached to the walls. 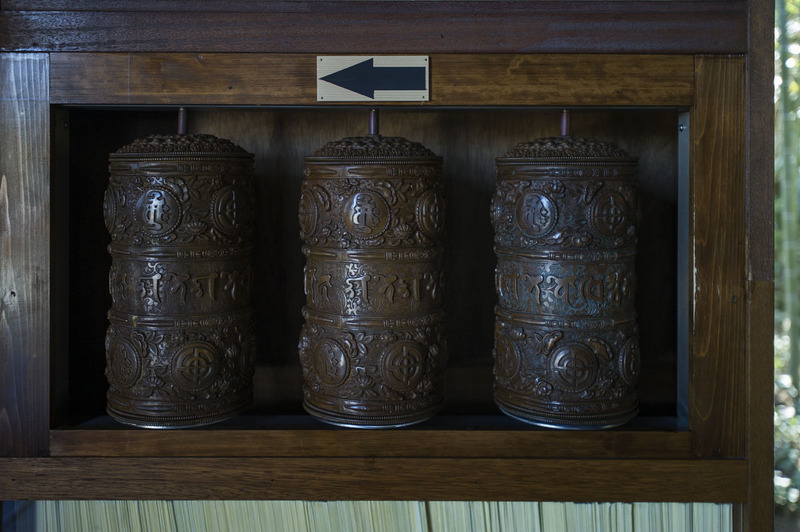 Prayer wheels are common in Tibetan Buddhism where the act of spinning a wheel containing a prayer is considered having the same effect as saying the prayer itself. Naturally one spin on this wheel is worth several weeks of actual praying!